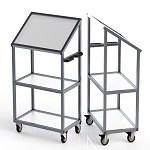 Regardless if you're on the job or at home, our carts will make transporting or demonstrating goods and products easier. 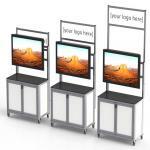 Whether it's a TV cart for a media center used at a tradeshow, or a laptop cart for mobile machine programming, to a custom designed material shuttle for a manufacturing process, we will fabricate what you need. Don't see what you're looking for here? Contact our certified designers today and we can offer design assistance for any custom requirement that will fit your exact project needs!